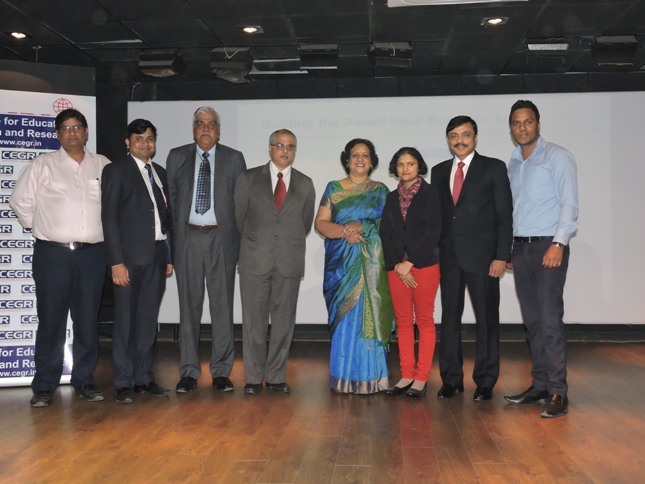 Centre for Education Growth and Research (CEGR) in association with New Delhi Institute of Management organized a National workshop on Entrepreneurship: Create an Entrepreneur on 24th February, 2015 at New Delhi Institute of Management, New Delhi. The programme was attended by country’s leading entrepreneurs, Corporate, academicians and students from various Colleges and Universities. The programme encouraged all the participants to discuss the issue, express views and also set a road map ahead for meeting country’s entrepreneurship needs. Ms. Jayashree Srivastava, President-CEGR welcomed the guests and briefed various key initiatives taken by CEGR in past. Ms. Jayashree Srivastava mentioned about the entrepreneurship campaign launched by CEGR in 2013 in which CEGR is providing free of cost training and mentorship to the students willing to take up entrepreneurship and in first phase CEGR has already covered more than 1000 students through lecture session by successful entrepreneurs in various colleges and Universities. The key note speaker Mr. Shantanu Srivastava, an IIT Kanpur graduate and MD & CEO of Ishan International Pvt. Ltd., MD of Dazzle Productions Pvt. Ltd. and Chairman Ishan Foundation shared his experience of venturing into entrepreneurship 20 years ago. He was earlier an Indian diplomat in Vietnam but resigned after 6 years of service to start his own business with a mere 852 dollars. Now he has offices in several ASEAN countries and is amongst the largest suppliers of small hydro power plants in that region. Mr. Lokesh Mehra, Edupreneur and Former Director-Microsoft mentioned CEGR played a pivotal role in providing a platform to students on how to identify and evaluate potential business opportunities, refining them to create a business model and understand risk-taking with an Entrepreneurial mindset. Speaking on the occasion, Mr. Vikas Khanduri, Founder & MD, Viva Voyages Pvt. Ltd. stressed on the importance of encouraging students to take up entrepreneurship as a door to open employability. He shared his personal experience with the students and mentioned I started Viva Voyages Pvt. Ltd. with Rs.4 Lakh only and Resigning from a senior, well paid position with a premier organization was not easy but I wanted to create my own business and draw with a free hand; I wanted the freedom and the flexibility to work on my terms, towards my goals. Mr. Ajay Tongar, Founder-Care Voice India mentioned that raising fund is not difficult in current scenario with so many accelerators and think tanks supporting the cause of entrepreneurship. Post Lunch Session, Mr. S. P. Singh, Former Director (HR) NTPC Ltd. stressed on the importance of encouraging students to take up entrepreneurship as a door to open employability. To admit all the students to industry may not be possible always. If the students are able to develop themselves as entrepreneurs, then a lot of industry and innovations will take place. Interacting with audience Mr. A. S. Oberoi, Founder , MBA Rendezvous spoke entrepreneurship is reflection of one's DNA, you got to be very clear on the parameters of why, how & when would you like to turn yourself as Entrepreneur? Mantra for becoming an Entrepreneur is I , me and we. It is 'me' who needs to be challenged repeatedly as that will trigger confidence to be sure to launch yourself as Entrepreneur, later execution part will be dependent on 'we' as resources and team building etc. Post lunch few more expert shared their success story and views and conference concluded with a vote of thanks by Mr. V. M. Bansal, Chairman-NDIM.